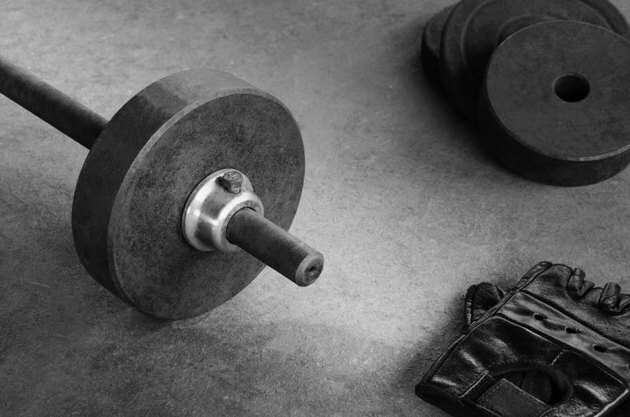 When the goal is to achieve a stronger, safer and more effective barbell bench press, sometimes the best thing to do is to get away from the bench altogether. Instead, opt for variation that can better enhance the qualities that are critical to improving your bench press. One variation of the bench press is the single-arm dumbbell bench press. This variation demands greater stability demand from the shoulder, shoulder girdle and core, because of the unbalanced load. With the dumbbell in one hand, its weight is working to rotate your body toward it, challenging your core — specifically, your internal and external obliques -- to stabilize you and keep you flat on the bench. Because of the greater stability demand and difficulty of the single arm dumbbell bench press, safety needs to be the first consideration when performing the exercise. Select a weight that is slightly lighter than the weight you would press with a two-arm dumbbell bench press. Once you've selected the appropriate weight, safely and effectively execute the single arm dumbbell bench press. HOW TO DO IT: Start sitting on the bench with the dumbbell resting on your thigh. Use both hands to bring the dumbbell up to shoulder height as you lie back on the bench in a controlled manner. Keep your abs engaged, thinking about pressing your low back to the bench, and drive your feet into the floor. With the dumbbell now in one hand and at shoulder height over one shoulder, keep the elbow 45 degrees to the body as you press it toward the ceiling. Slowly lower the dumbbell back down, not allowing the shoulder blade to tip forward or the elbow to pass too far behind the body as you approach the bottom of the motion. Repeat for reps and switch sides. Although the single-arm dumbbell position allows you to achieve a greater range of motion when compared to the standard barbell bench press, don't allow the dumbbell to go too low and actually contact the shoulder or upper chest. Stop the dumbbell when the elbow is slightly less than 90 degrees, and the dumbbell is hovering just above the shoulder and upper chest. Remember, this exercise creates a greater stability demand throughout the entire body. 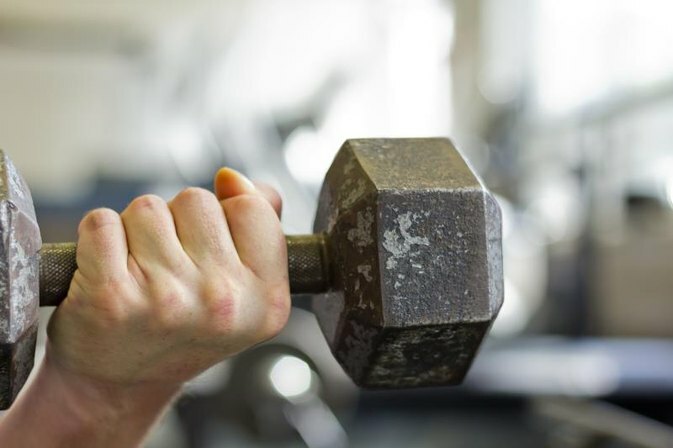 Don't grab the bench with your empty hand, as that decreases the amount of work your core is required to perform, eliminating one of the greatest benefits of the single-arm dumbbell bench press.